Bat compression test results describe the amount of pressure required to compress the barrel of a bat. A higher compression result (usually stated in terms of pounds per area) means a barrel’s walls are more rigid. A bat with a lower compression means the barrel walls are more flexible or elastic. Some believe that a more elastic barrel wall is able to produce faster exit speeds. In large measure, according to every manufacturer and bat engineer we spoke to, the belief is not true. We discussed the topic with every major manufacturer and compile their sentiment, as we understood it, below. Bat compression can be a useful tool to estimate the performance of a given bat construction, but taking the compression value without reference will almost never provide an accurate measure of true bat performance. Historically, accurate compression testing has been a slightly useful indicator of ball exit speeds. But, non-linear designs, common in performance bats these days, makes compression tests less useful in predicting exit speeds. As well, quick and accessible compression measurements, made possible by field level compressors, lack precision required to make honest correlations to ball exit speeds. Measuring only how loose the springs are in your trampoline tells you virtually nothing about how high you can jump. We asked several industry experts from major manufacturer to comment on the usefulness of bat compression. Read below what they had to say about bat compression tests predictive power of ball exit speeds. Here is a sampling of compression tests we took on bats at Bat Digest. As we say in this article, making full on determinations about ball exit speeds based on these numbers doesn’t mean very much. You can see this list on our ball exit speed spreadsheet too. Non-linear bat designs, like this 4 piece Rawlings BBCOR Quatro, can have an exception with certification labs for a lower compression value than other bats in the same class. The lower allowed compression says more about the unique design then it does about ball exit speed. (Although, we do love its ball exit speed). One useful way to visualize how easier compression is not always better is to consider the trampoline in your backyard. As the springs become more loose on the trampoline, can you jump higher or lower? The answer, of course, depends. Specifically, how much does the person jumping weigh and how much elasticity is retained in the springs as they become loose? We could imagine an equation that optimizes the trampoline’s effectiveness. That equation, based on factors like the jumper’s weight and leg strength, as well as the quality of the spring’s recoil, would set the optimal amount of taut in the tramp’s springs. Much like the perfectly dialed in trampoline, a bat’s effectiveness is not always maximized by simply making the barrel walls more flexible. Or, as we might say, loosening the springs of the bat. Instead, the right elasticity in the barrel simply depends. Factors like pitch speed, bat and ball weight as well as the quality of the barrel’s material all play significant factors in the optimal compression. That optimal compression is one factor in ball exit speeds, but far from one and the same. Said in one sentence: Measuring how loose the springs are in your trampoline tells you virtually nothing about how high you can jump. 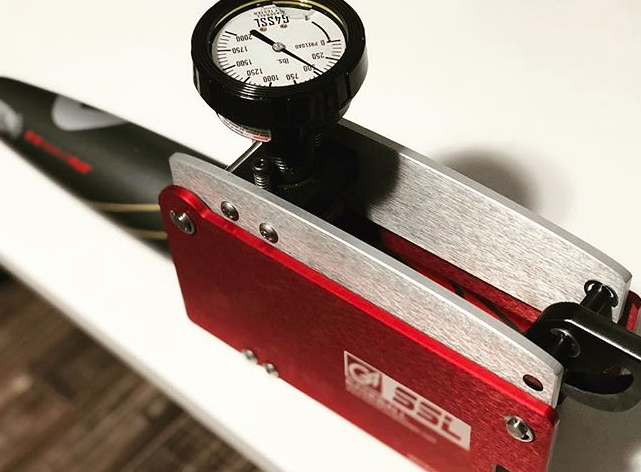 When measuring within the same class of bat (BBCOR, USSSA, USA), our bat compression test results provided little predictive power for exit speed. One general theme we gathered from the experts was that bat compression test results are useful in monitoring the life of a bat. As a composite bat is worked in more, its compression will become easier. We also had a good back and forth with some engineers at DeMarini who felt, without putting words in their mouth, much like everyone else we spoke to. They add how bat compression done at a field level (with devices like the one you see in the video above) aren’t terribly reliable. Most bats in a particular classification sit real close to each other on a compression test scale. Small changes from one bat to another are not predictive enough, nor is the device accurate enough, to make determinations about ball exit speeds. Compression doesn’t matter to me, I’m hitting bombs either way…Hitters should focus less on barrel compression and more on swing mechanics, timing and approach at the plate. Blaming your bat for a bad AB is counter-productive. Here are some notes we took from our conversation. Paraphrased, as far as we understood it. Anyone who has swung DeMarini’s top shelf fastpitch line generally love it. And fastpitch players are much more familiar than baseball players with compression tests. Although many major tournaments use compression tests to disqualify bats, compression is not a fool proof indicator of exit speeds. Lower compression does not necessarily mean better performance. Especially when you consider tee work, soft toss and game speeds. Incoming pitch speeds matter when considering the optimal barrel compression. And it isn’t always the lowest. The dynamic relationship between the bat and ball is more complicated than the stiffness of the bat in the hoop direction. Compression is measured, but not used for performance testing certification for a reason. Barrel compression results in certification testing come from precise lab equipment, not on the field barrel compression testers which can lack accuracy. Axe Bats builds the back side of their bat’s barrel different than the front. This is made possible by the ergonomic handle that forces hitting on one side of the barrel. In turn, the compression numbers for an axe barrel do not make much sense when compared to other manufacturers. It is just one, of many, non-linear designs that make the barrel compression results in today’s market not very useful. A well respected Easton engineer had similar things to say. Simply, the difference between compression and exit speeds are uncorrelated enough to put little stock into compression tests alone. Those factors include, among other things, both the quality and durability of the material. Rawlings said, without surprise at this point, very similar things. Compression made more sense as a stand alone performance test a long time ago. Now, construction is “non-linear.” Meaning, bats aren’t simply designed with a single set of characteristics throughout the barrel. As such, measuring pressures at a point of the bat and calling it a performance comparison is not accurate. When do Compression Numbers Matter? Easton’s Ghost X is a great example highlighting the value of things OTHER than barrel compression. People love this bat not just for ball exit speeds, but feel on hits and mishits as well as the durability of the composite. Compression numbers matter in a few specific instances. Some leagues (mostly in the softball space) require your bat be above a certain compression. These compression tests, done at the field level, attempt to remove bats from play that are too hot. Although leagues are obviously more than welcome to enforce a minimum compression test standard for bats in their game, it is far from a test on performance. Several bats removed from play due to a pressure measurement have passed the standards test. If you are looking to buy an illegal/doctored bat that has been shaved or rolled, then a compression test pre and post-procedure should tell you the bat has indeed been manipulated. Compression tests are common place for those that sell illegal bats. Bat compression test results can tell you how well your bat has been worked in. Our intent at Bat Digest is to provide parents and players a compression number and how many times it takes to work in bats for a better compression. You’ll find that data on our raw exit speed page.